Byrne writes, ‘the starting point for radicalisation may in fact be rage rather than religion…it’s not the madrassa that is the problem, it’s your mates.’ Book review. 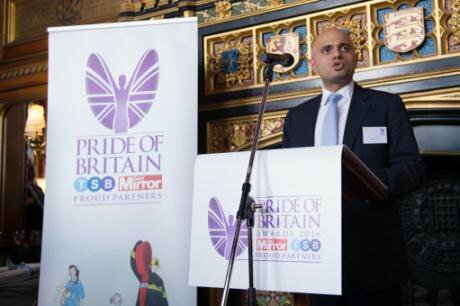 Communities Secretary Sajid Javid speaks at the Pride Of Britain Awards launch in Speakers House, Houses of Parliament, London, October 2016. Stefan Rousseau/Press Association. All rights reserved.For years successive UK governments under the ‘PREVENT’ programme have tried to tackle ‘extremism’ or ‘radicalisation’ – that is to say, stop individuals, mainly youngsters, supporting or becoming jihadists. The latest tactic, promoted by UK communities secretary, Sajid Javid is to get those holding any public office to swear an oath of allegiance to British values. Far from promoting ‘integration’ this would be more likely to provoke hostility and resentment. It certainly will not help discourage anyone from embracing violent Islamic ideology. Prevent has manifestly become counter-productive. Two recent books help to explain why, very welcome contributions to what is still a much-needed debate. One is Radicalized, New Jihadists and the Threat to the West, by Peter Neumann (published by IB Tauris), an extremely useful guide by the Professor of Security Studies at King’s College, London and director there of the International Centre for the Study of Radicalisation (ICSR) providing the context and background of the latest wave of terrorist groups. Yet that strategic difference may now become irrelevant as IS loses territory in Syria and Iraq as a result of US-led air strikes and advances on the ground by a US and UK-trained Iraqi army – attacks which, as western security and intelligence chiefs now predict, will increase the terrorist threat in western countries, notably by lone wolves. For those living in corrupt regimes, extremist ideology had the attraction of providing certainty and order. For those in the west tempted by jihadism, the causes are different. Their anger was fuelled by western foreign policy – something Tony Blair strongly denied, though his claim was roundly rejected by MI5 and Home Office. But there is little credible point in the government, any western government, paying lip service to the principle of tolerance, of pledging allegiance to, say, ‘freedom from abuse’, or ‘a belief in equality’, as Javid suggests, when immigrants are threatened and treated as outsiders, data is collected on children whose parents are born abroad, inequality and poverty are increasing, and overcrowded prisons become incubators for extremist views. Byrne – whose Birmingham constituency has afforded him much first-hand experience, warns that ‘frontline is online, and it is here that we confront a new digital danger slide, like a roller-coaster, capable of taking a young person from rage to radicalisation…’ Yet websites of the conventional media encourage Islamophobia, as other websites encourage jihadism. Many who support the British government indulge in hostile rhetoric that encourages extremism on all sides, which the government says it abhors. Promoting the tolerant society ministers say they want needs more than lip service. Byrne’s book is the more lively read, and the author in the end strikes an optimistic note. Neumann offers a stringent analysis and pleads for an effective ‘national prevention strategy’ before it is too late. The question of how to achieve it still goes unanswered. It will require profound changes in British civil society, not strategies promoted by a government, or even a parliament, which still has no realistic idea of what Britain’s future role in the world could be.